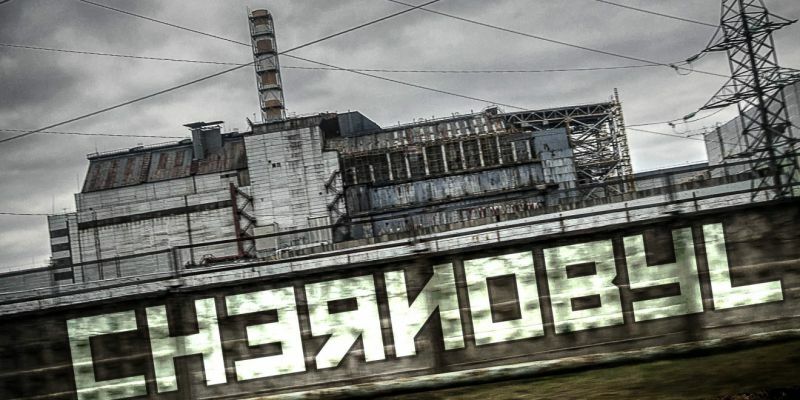 On 26 April 1986, in Chernobyl, Ukraine, the most serious accident ever occurred in a nuclear power plant. For a series of events, partly caused by human errors, partly due to design shortcomings, the fusion of the reactor core occurred, followed by a very strong explosion that hit the reactor and caused a large fire. A cloud of radioactive material escaped out of the reactor and fell on vast areas around the power plant, contaminating them heavily and requiring evacuation and resettlement in other areas of about 336,000 people. Radioactive clouds also reached Eastern Europe, Finland and Scandinavia and other countries, including Italy, France, Germany, Switzerland, Austria and the Balkans, to portions of the eastern coast of North America. The Chernobyl event has left some traces even in Italy. The radioactive fallout was uneven, some areas were more affected by others, mainly due to the direction of the winds and the amount of precipitation. 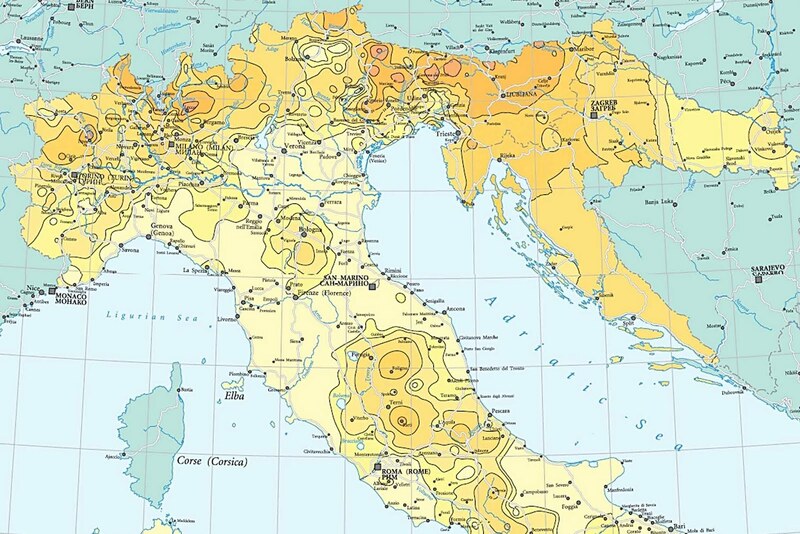 The map below shows radioactive fallout in Italy. You can see how the most affected areas are those of the Eastern Alps and Lombardy. Numerous measurement campaigns have been made and hundreds of scientific articles have been published. At the amateur level there are also initiatives that are concerned with assessing the environmental impact of this event. For example, his friend A. Marturini (A.Marturini) has done several gamma spectrometry measurements on samples of mushrooms harvested in the Como area (one of the most affected in Italy by the fallout). 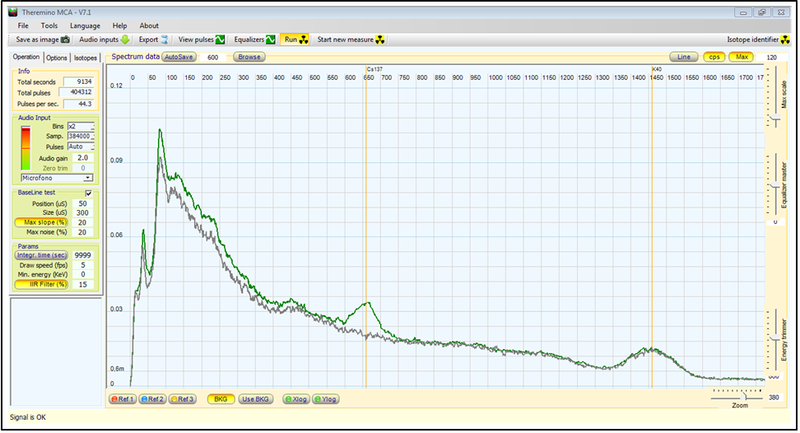 The figure below shows a sample of dried mushrooms with its gamma spectrum obtained in 2016, at 30 years after the disaster, in which the peak of Cesium 137 at 660 KeV is still evident! Thanks to our friend A. Marturini we have been able to examine a sample of soil coming from Belarus, namely from Chachersk (Chachersk), near Gomel (Gomel). Chachersk is 190 km north of Chernobyl and has been fully invested by radioactive cloud on 26 and 27 April 1986, shortly after the disaster. 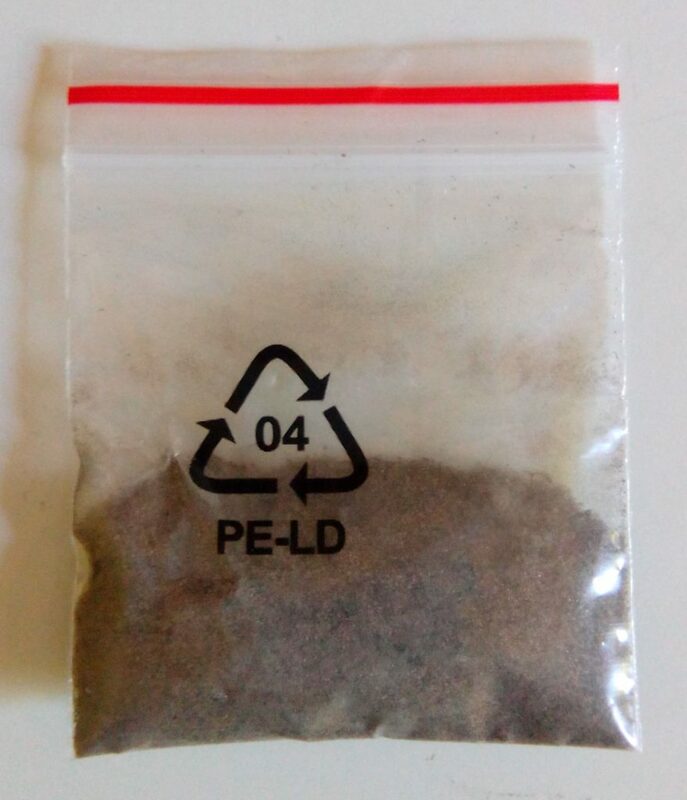 This is 5.6 g contained in the plastic bag visible in the image to the side. We acquired the gamma spectrum with the 63×63 mm crystal probe (with the sample soil placed in contact with the detector), Theremino adapter and Theremino MCA. The spectrum obtained is that shown in the pictures below. We notice the presence of a peak at 662 KeV of Cesium 137, evident especially when overlapping the of background spectrum . Prior to measuring the sample of Belarus soil we have calibrated the probe with a 0.25 μCi Cesium 137 sample source using the BeqMoni software, suitable for counting measurements. 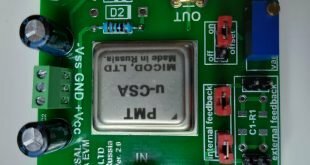 The source has been prepared in 06/2013 and the measurement has been done in 06/2017, so the time interval is four years, taking into account the 30.17 years of CS 137 half-life, a current value of 0.228 μCi or 8436 Bq is calculated. By measuring this sample source, in which we placed the source at a distance from the detector of 5 cm, we obtained the following spectrum, in which the ROI (region of interest) configured for Cesium 137 is highlighted. The proportionality constant between measured activity and absolute activity has been tuned until the measured value is equal to the calculated one, as seen in the picture on the side. The parameters of the detector, geometric factor and efficiency, in our case were obtained experimentally by the calibration procedure with the sample source and together are the constant of proportionality between measured activity and absolute activity. After calibrating the energy scale, configuring the software with the cesium 137 ROI and configuring the relationship between measured activity and absolute activity we did the measurement of the soil sample. In practice, we determine the activity of the soil sample by comparing it with the activity of the sample source. For this procedure to be reliable you must use the same geometric configuration (probe position, sample position, etc.) used for sample sample measurement. In this case, however, there is a difference due to the fact that the sample source is point-like while the soil sample is not. This difference will underestimate the measure of activity. The images below show the gamma spectrum obtained with BeqMoni, to which the background spectrum is superimposed. The pink area corresponds to the ROI region of Cesium 137, around 662 KeV. The Orange area corresponds to the net contribution due to the soil sample in question. 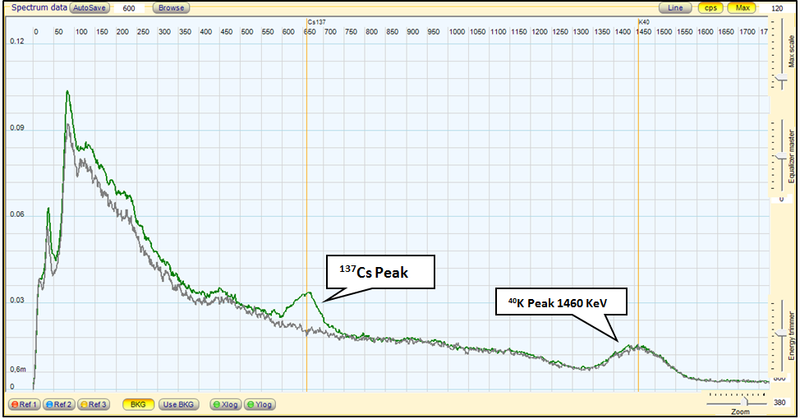 In the magnified image of the spectrum you see how the maximum count is exactly at 662 KeV of Cesium 137. The cesium peak is less evident than the spectrum taken with Theremino MCA because in that case the soil sample was placed in contact with the detector, while in this case we used the same configuration used for calibration. This is the initial soil radioactivity due to Cesium 137 due to the radioactive fallout caused by the Chernobyl accident.